As a devout BDB fan I have been W.A.I.T.I.N.G in anticipation for this very book. Blay and Qhuinn stole my heart many books ago with the tragedy of two souls meant to be together, unrequited love and confusion over sexuality. 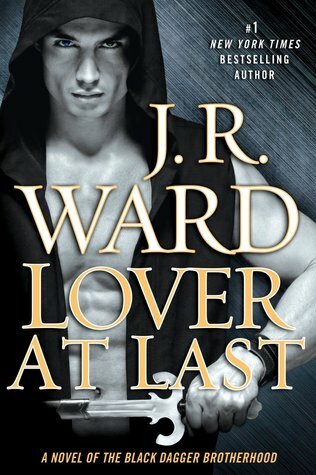 And oh wow the pressure from us BDB readers on J.R Ward to get Qhuay’s story spot on; well it must have been immense! I absolutely inhaled every word in this very long book. I am not going to say too much about their story as with this one, more than any other; no spoilers should be out there to ruin a BDB reader’s anticipation and excitement. I just want to stress though that this is one series you DO need to read in order and not skip books in as you will be completely lost in the on-going fight and storyline that continues from book to book. So how did I feel the minute I had read the last word? Emotional – I was crying like a baby. Elated, Satisfied yet also disappointed (which I will get to in a minute). This series, if you know me, is one of my all-time favourites. It was my first paranormal and it is the series I keep going back to and re-read whenever I can, that is how much I love it. As the majority of BDB readers I have my favourite male – Zsadist so his story is read more often but yes, absolutely, Blay and Qhuinn, this was the one I have been most looking forward to. As always the writing is beyond excellent, it has The Warden’s FAB sense of humour, the intrigue, the intensity, the sensuality and the passion! This Author is right there at the top for me! But here is my question…why the change from the first half of the series? Why do we need so many stories within one book thereby neglecting the couple this story is really about? I have noticed that in the last few books everyone becomes pretty much a side character, too many stories crammed into one, the main couple barely in the spotlight. I want back to the good old days, earlier in the series when it was first and foremost about the couple, their journey, their thoughts and struggles. Yes, absolutely we need the fight, we need the action, the journey and to spend time with other characters but seriously not so much that our main couple come across as a novella within another story. In this one we do not only have Blay & Qhuinn who, let’s be honest, is what we were all waiting so desperately for, but we also have Layla & Xcor, Assail and Trez; we have the story lines of Drug Dealing, The Lessers, The Council and the Band of Bastards. That’s way too much crammed into one book in my honest opinion. I never skim read this one but I can fully understand why readers would. At times I hate to admit it, I felt frustratingly close. So, this was mostly Qhuinn’s story in my opinion. He had me in tears so many times. A messed up childhood, what with his family treating him as something disgusting they stepped on with their shoe; unloved and abhorred. All because of his one green and one blue eye. The only constant in his life since the beginning has been Blay. Blay who was and is his one ‘constant’; who gives him strength and the love he so deeply needed and desired….and still does. We know a lot of his story already but learn more, so much more and it broke my heart! ‘Unbidden, his feet took another step forward. “I’m sorry”…All of a sudden he was saying these words over and over again, repeating them with each footfall that brought him closer to Blay. “I’m sorry… I’m sorry…. I’m sorry”….’ – I was SOBBING! Blay is so tough, compassionate and kind-hearted. He loves, protects and feels with passion and fierceness. He is loyal to a fault and completely self-less. “Make it stop” from Qhuinn….how can he not? Again, I was SOBBING! So yes, I loved it, how could I not. When I was knee-deep in Qhuinn and Blay it was beyond perfect, it was what I have been waiting for but at the end of the day I felt slightly cheated and I feel that they were cheated too; they should have been given so much more, they deserved it after all they had been through! Yes they got a killer of an Epilogue, but I hate to say this, I feel as if the series is losing the very essence of what the Black Dagger Brotherhood was all about and this makes me so very sad. I know the Warden will probably never read this review on our little blog but I just wish and hope that this is not what is to come and that somehow we can go back to basics and they start to shine as they did before, because this is one outstanding series! Overall, yes we were absolutely given our much needed HEA through unravelling pasts and secrets. We had tears, heartache, truths uncovered and realisations. We had passion and the much anticipated release of that important bonding scent. We got it and I LOVED every minute and every word! Great review Gitte, I’ve found with the last few there was so much going on and so many different characters to remember confusion was setting in, I’ll read this one as I really want to see how Blay and Quinn get together but will definitely hold off on book 12. Thanks for the review. I just started this last night. I’m disappointed with all that I’m hearing about this story. I was really hoping for so much more. I hope that the J.R. wasn’t worried we wouldn’t read a story like this. I am right in the middle of this book and I may not sleep again until I’ve finished! So good. Just like Gitte, this series was my first paranormal romance experience and after months of no BDB, I had forgotten how clever and laugh-out-loud funny she is! I am also surprised at how I am instantly sucked into all the emotional connections between the brothers. I do agree that there are too many stories going on in this book…I would prefer to have the Blay/Qhuinn romance as the focus of the book without all of the distractions, but I trust that she knows what she is doing 🙂 When I first began the series, I listened to the audiobook, so I’ve stayed with that format because the narrator has already established the voices of the characters for me. He is fantastic, so if anyone out there is considering starting this series, I highly recommend the audio version. I am a mother of two little ones so I can pop in the earbuds and listen all day! (amazing how much housework I can get done!) Ok, there’s my “halfway through” review!